UltraBac Media Builder is a disk creation utility for generating an UltraBac Disaster Recovery (UBDR) Gold CD or USB key. UltraBac Media Builder is automatically installed when you install UltraBac. There are two different versions of UBDR Gold. Which one you use depends on which operating system you need to restore; both versions support BIOS and UEFI. 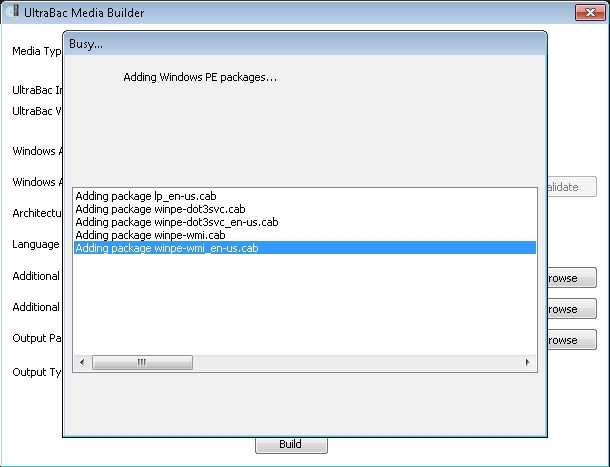 UltraBac Media Builder requires that either the Windows Automated Installation Kit (AIK) or the Assessment and Deployment Kit (ADK) be installed. 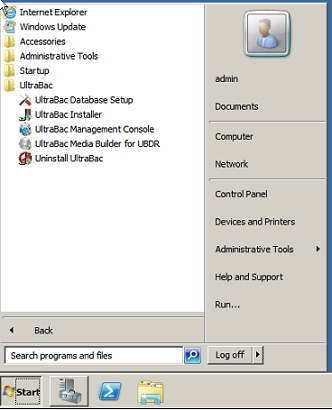 If Windows AIK or ADK is not installed on your computer, UltraBac Media Builder will detect that it is not installed and will prompt the installation by providing a link to its download location. Windows AIK/ADK can be installed on a machine with the Windows 7 or later operating system. Windows AIK/ADK must be installed using an account with Administrator permissions. The machine used for UltraBac Media Builder to generate the UBDR Gold ISO must have a CD/DVD burner in order to burn the ISOs to CD/DVD. If you need to restore Windows Vista / 7, or Windows Server 2008 / 2008 R2 then it will require the installation of the Windows Automated Installation Kit (AIK) and use WinPE 3.1. Please see "UBDR with WinPE 3.1." 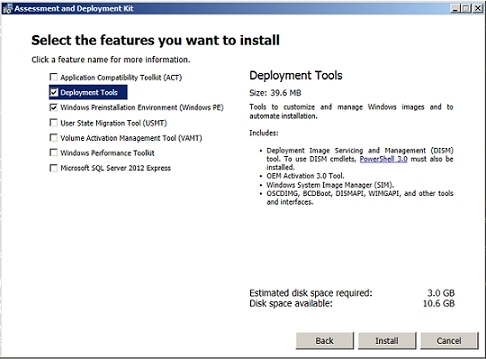 If you need to restore Windows 8 / 8.1 or Windows Server 2012 / 2012 R2 then it will require the installation of the Assessment and Deployment toolkit (ADK 8.0 / 8.1) and use WinPE 4.0 / 5.0. Please see "UBDR with WinPE 4.0 / 5.0." 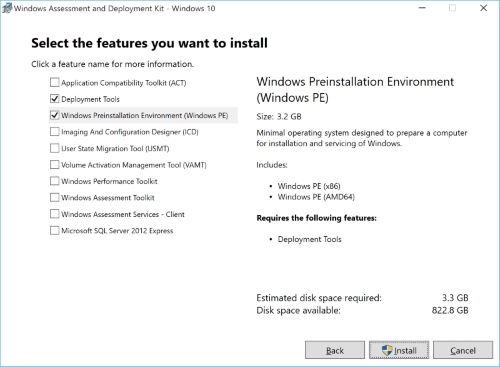 If you need to restore Windows 10 then it will require the installation of the Assessment and Deployment toolkit (ADK 10) and use WinPE 10.0. Please see "UBDR with WinPE 10.0." NOTE: You must have a UBDR Gold license in order to use UltraBac Media Builder. An UltraBac license check is performed and, if an evaluation license is detected, the UltraBac Media Builder will not run. NOTE: If you need to build UBDR for a processor architecture other than the current OS you must select copy additional binaries during the UltraBac installation process. NOTE: Windows AIK must already be installed. You can download it here and the required SP1 supplement here. There is no installer for the supplement, simply mount the ISO and copy the contents (overwriting existing files) in the Windows AIK directory. Default location is "C:\Program Files\Windows AIK\Tools\PETools"
To open UltraBac's Media Builder, click "Start,"/"All Programs,"/"UltraBac,"/"UltraBac Media Builder for UBDR" as seen in Figure 1. Fig. 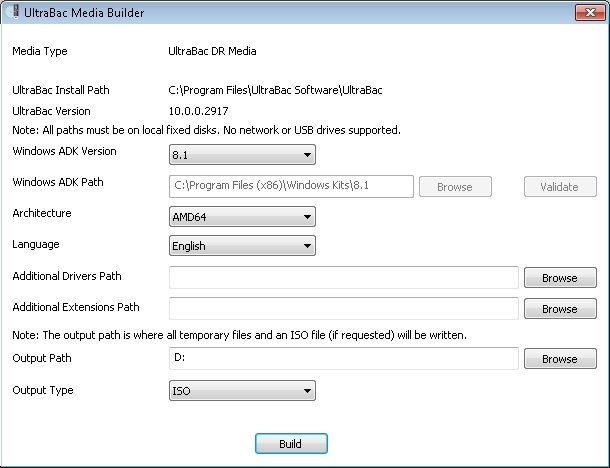 1 - Click "UltraBac Media Builder for UBDR." The "UltraBac Media Builder for UBDR" window will open as seen in Figure 2. Fig. 2 - UltraBac Media Builder. If you have both AIK and ADK installed, change the "Windows ADK/AIK Version" to "7.0." If UltraBac Media Builder is not detecting that AIK is installed choose "Custom." Change "Windows ADK/AIK Path" to point to the directory where it is installed. Choose the Architecture of the OS you plan to restore. If you have a non-English build of UltraBac installed you may chose a Language other than English. To install additional drivers for network cards, SCSI / SAS / RAID controllers, place them in a single parent directory and browse to the "Additional Drivers Path." Otherwise leave this field blank. To install additional third party applications, place them in a single parent directory and browse to the "Additional Extensions Path." Otherwise leave this field blank. To see how to organize an extension directory see UBQ000??? : Creating UltraBac Media Builder Extensions. To change the Output Path from "%HOMEPATH%\Documents\MediaBuiler," click "Browse" and navigate to a new output directory. To create UBDR on a USB drive, change "Output Type" from ISO to USB. It is not necessary to insert a USB drive until prompted to do so. Click "Build" and a progress window will appear displaying the current action. Fig. 3 - Creating UBDR. 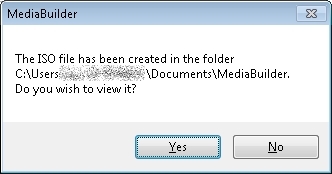 Once building is complete, a prompt to copy any additional files to the media will appear. 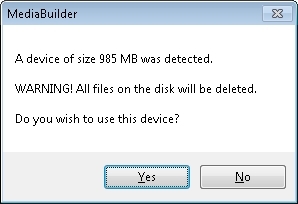 Clicking "Yes" will open Windows Explorer to the mounted WIM folder. Once the files are copied close the Explorer window and click "OK" to continue building UBDR. Fig. 4 - Include additional files. Fig. 5 - After adding additional files. The ISO will now be created, unless USB was selected as the "Output Type." Fig. 6 - ISO created successfully. NOTE: When choosing USB, the USB flash disk will be erased and formatted. All contents will be lost. Make sure that the USB drive you wish to use is not plugged into the system. Then click "OK" to scan the drives on the system. Fig. 7 - Remove USB drive for the before scan. Insert the USB drive and click "OK" to scan the drives on the system. UltraBac will compare the differences between the two scans and use the newly found drive. Fig. 8 - Insert USB drive for the after scan. If the drive found is the one you wish to use, click "Yes" to wipe the drive and continue. Fig. 9 - USB drive detected. After the wipe, partition creation, formatting, and files are copied. Fig. 10 - UBDR successfully created on USB drive.